Add a traditional feel to your kitchen with this breakfast kitchen island table in an antique walnut finish, with two storage draws at end each. 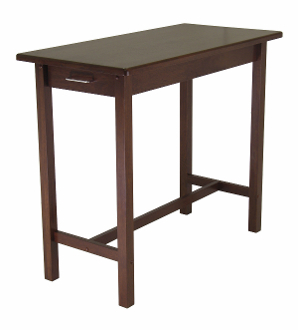 Table assembled size is 39.37"W x 19.69"D x 33.27"H. Inside drawer dimension is 11.34"W x 13.19"D x 3.54"H. Made with combination of solid and composite wood in warm walnut finish. Assembly Required.